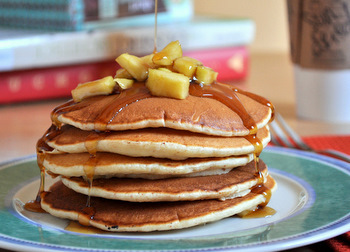 Fruit often winds up on top of a stack of pancakes, rather than inside the pancakes themselves, both in the form of whole pieces of fruit and incorporated into a syrup or topping. This is usually because classic buttermilk pancakes are pretty darn good on their own and it’s easy to simply make plain pancakes and put the fruit on top. This is a great option, of course, but it’s nice to mix things up by putting the fruit inside of your pancakes from time to time for a little more flavor. These Apple Cinnamon Buttermilk Pancakes are a great example because they have chunks of sauteed apple inside of every pancake, adding more flavor and texture to every bite of breakfast. I start off this recipe by dicing up some apples and sauteeing them in a little bit of butter and sugar until they are tender. Just about any kind of apple will work, so use what you have on hand. The pancakes themselves are not sweet (except for the syrup!) so I would recommend sweeter apples as opposed to tart Granny Smith types. Next, a cinnamon and buttermilk pancake batter is prepared and dolloped onto a hot griddle. I add the apple pieces into each pancake as it’s cooking, placing the pieces on the top of each pancake before it has “set.” The apples stay in place when the pancakes are flipped and pick up a little extra caramelization from the hot pan. The finished pancakes are fluffy and light, with a nice cinnamon flavor and plenty of pieces of apple. The apples are tender, but not mushy, so they add a little texture to the pancakes and while guaranteeing that your breakfast is going to have a good apple flavor. Maple syrup is a fantastic compliment to the apples and cinnamon in the pancakes, so definitely splurge on the real thing when serving these. Place a large skillet over medium-high heat. Add diced apples, butter and brown sugar. Cook, stirring occasionally, until apples are tender, or about 5 minutes. Remove from heat. In a medium bowl or large measuring cup, whisk together sugar, eggs, buttermilk and vanilla until smooth. Pour into flour mixture and whisk until well-combined. Batter may be slightly lumpy. Heat a nonstick griddle (or large nonstick skillet) to medium-high heat, and wait until the surface is hot enough that a drop of water skitters around the pan when dropped onto it (if the water evaporates immediately, the pan is too hot). Add batter onto pan in dollops (approx 1/4-1/3 cup) and cook until the surface of the pancake starts to bubble. Add about 1 tbsp of the sauteed apples to the pancake. Continue to cook until the bottom of the pancake is golden, then then flip and cook the second side until golden. Serve immediately, with maple syrup and more diced apples. Mmmm. I love apples in baked goods. 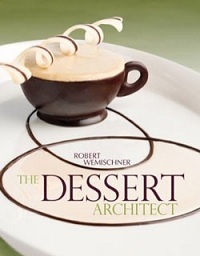 These look amazing, bookmarking to try. 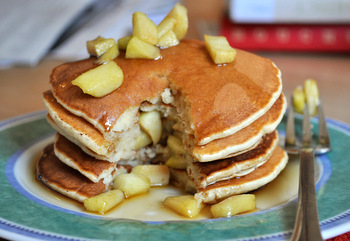 I love apple in most anything but I like buttermilk in pancakes even better. These are so pretty! I’ve made pancakes with blueberries and strawberries, but I never thought of using apples before. They look irresistible! 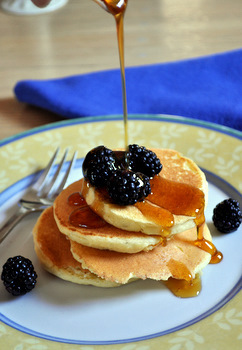 I love making pancakes for my family on Sunday mornings, I will have to try out this recipe. Thanks for sharing these pancakes look very tasty! I’ve made this recipe twice now, once using apples and this morning using blueberries instead. YUM! Your gorgeous photo really inspired me and I was not disappointed. Thanks for sharing!